With his trademark restraint and invitation, C.E. Alexander introduces us to Victor Ossis, the widower who relocates his young son to New Potomac, a small development in rural Wyoming. Soon we meet Evelyn Turner, the settlement founder, who offers much and seems to ask little in return. Next is Marta: lovely, thin and reticent. But more alluring than its residents is the town itself, with high concrete walls ideal for keeping secrets in—and for keeping them out. Within a few weeks of arriving, Victor is urged to lead a baffling murder investigation. It is his first act as a law enforcement officer. Alexander’s fiction debut was The Music and the Spires (December 2012), also available through Zidi Publishing. 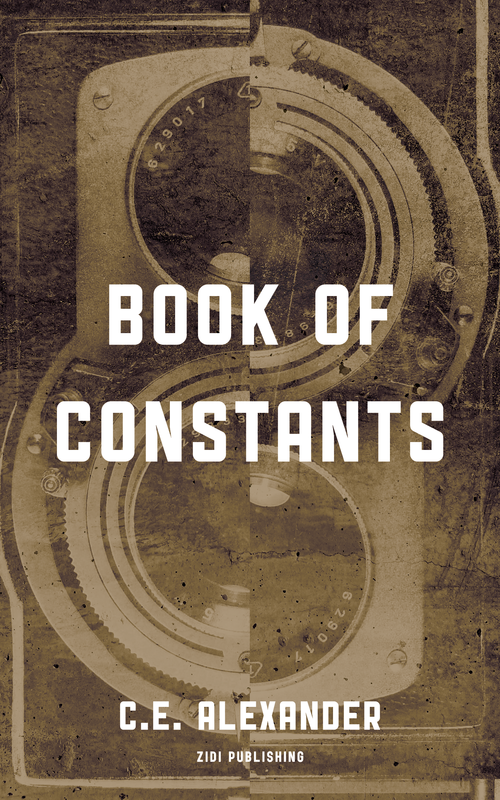 Readers declared that the anthology was “dense,” “vivid” and “gorgeous.” Book of Constants offers the same ontological violence as its predecessor—with clear nods to Shirley Jackson and Edgar Allan Poe—yet with a distinctive voice all its own. C.E. Alexander lives outside of Plano, Texas with his wife and two children. He works as a sales manager for a metal fabricator in Dallas, and tweets about everything other than his books @CAlexanderRun. read it this morning and well, the ending was a surprise. i liked how it started somehow bleak, but then just not bleak enough to be hopeless. or maybe forlorn but people still keep on existing. and how it’s not sure what’s going on, how there is something sinister, but that seems to come more from the place and the people as such, from the atmosphere and how i felt that something could happen to victor and his son…. out of this general forlornness, or also lawless area one might want a book of constants, even if those constant are not as solid as they seem and this is an important tragic conflict, constants and their frailty. the title is great. loved the fotographic interludes, ‘shallow field, true depth’, loved it. you must be a photographer too, the way you write about it. This story draws you in from the get go and is impossible to put down. The stylish writing of C E Alexander, his ability to immediately set the tone of the story and his attention to detail are just a few reasons to read this book. You get a sense of the macabre and an undercurrent of uneasiness throughout the story and the ending is, well, I’m not going to tell. Hurry up and write another book, Mr. Alexander. I love your writing. Couldn’t put this down! I literally had goosebumps reading certain scenes (don’t want to give anything away). If you enjoy a good mystery, you’ll love this story. Add to it Alexander’s eloquent, intense writing and you have yourself a very satisfying read. Enjoy, I sure did! This novella casts a spell over the reader. Its atmospheric rhythm – created by excellent language, excellent timing – captures the mind and instantly, you are there, part of this created (re-created) landscape. Without having to describe it, the author ensures this post-apocalyptic country still bears the crazy bureaucracy of the old one from which it is spawned. The characters are as stubbornly pragmatic, the words they use borrowed from other times, other legislations; and although procedures seem hilarious, we know they are full of dread. Nothing prepares the reader for the solution to the mystery – but the hints are there. You leaf back and find them, surprised at yourself for being so caught up in the protagonist’s anguish. His soft sweet nature and how he cares for Kobe. Who Kobe is I’ll not say – it’s in the important first page of this very good story.